Before opening the Christmas presents it’s time to check what’s in the monthly notes in December. This year there’s not much extra holidays so use them wisely :) Merry Christmas! Good article summarizing the common characteristics of Microservices, the main challenges of building Microservices, and how to leverage AWS to overcome those challenges. Did you know that after the first atomic bombs in the 1940s and 1950s the background radiation levels increased across the world and thus modern steel is contaminated with radionuclides because its production used atmospheric air. Low background steel is so called because it does not suffer from such nuclear contamination. This steel is used in devices that require the highest sensitivity for detecting radionuclides. Late Autumn and rain has arrived to Finland and now we have good reason to stay at home and read about new ideas and what happens in technology. Free and open course to learn about tools used to analyse flaws in software systems, necessary knowledge to build secure software systems, the skills needed to perform risk and threat analysis on existing systems and the relevant legislation within EU. It’s a course series by University of Helsinki in collaboration with F‑Secure Cyber Security Academy that focuses on building core knowledge and abilities related to the work of a cyber security professional. Thinking about how to format your code? Luckily Google Style Guides has solved it for you. And with explanations like for Java. O’Reilly is known for their programming books and they’ve compiled the latest insights of what’s happening in the world of software engineering, architecture, and open source. Lot’s of topics regarding microservices from different aspects. “AWS’s own documentation is a great but sprawling resource few have time to read fully, and it doesn’t include anything but official facts, so omits experiences of engineers.” Open Guides: AWS is by and for engineers who use AWS. It aims to be a useful, living reference that consolidates links, tips, gotchas, and best practices. It arose from discussion and editing over beers by several engineers who have used AWS extensively. Progressive Web Apps (PWA) take advantage of new technologies to bring the best of mobile sites & native apps to users. In the series of posts Addy Osmani shares his experience turning React-based web apps into PWAs. Making a cup of tea should be simple enough but if you’re using a Wi-Fi kettle it doesn’t always go according to plan. Development and operations, DevOps, is in my opinion essential for getting things done with timely manner and it’s always good to hear how others are doing it by attending meetups. This time DevOps Finland went Mobile and we heard nice presentations about continuous delivery for mobile applications, mobile testing with Appium and the Robot Framework and efficient mobile development cycle. Compared to developing Web applications mobile brings some extra hurdles to jump but nothing that’s not solvable. Here are my short notes about the meetup. The meetup was hosted by Zalando Technology at their new office here in Helsinki. Zalando is known to many as that online store that sells shoes, clothing and other fashion items but things don’t sell themselves and behind the scenes they have lots of technologies to keep things running. For the record I think they said that the meetup had 65 attendees of the 100. Also if mobile is your thing there’s a new Meetup group for mobile developers in Finland which was announced at the meetup. They’re also on Twitter and Facebook. Rami Rantala from Zalando talked about “Continuous Delivery for Mobile Applications” and how they’re managing releases of their Fleek app which is available for Android and iOS in German markets. They didn’t arrive to the final setup straightforward and it was iterative approach with how Git is used, code merged and releases done. Using Fastlane for all tedious tasks, like generating screenshots, dealing with code signing, and releasing your application made automating things easier. Interesting note was that their build server slaves are ansible managed Mac Minis on Rami’s desk. They had solved the problems nicely but testing is still difficult. DevOps and rollbacks don’t work together, you roll forward. Mobile testing can be done with different tools and one option is to use Robot Framework just like for Web applications. Elmeri Poikolainen from Eficode demoed how to use Appium and run Robot Framework tests on real device. It has some limitations and I think with native applications it could be better to use native test tools like what Xcode has to offer. The last and most fast-paced talk was by Jerry Jalava from Qvik about “Efficient Mobile Development Cycle“. He talked about different practices and tools in the development cycle and it was nice overview to the complexity of the process from design to done. You can for example run remote preview with 27 devices. This time weekly notes provides pointers to last weeks JavaOne, teaches you to design better forms, tells about 171 words every programmer should understand and how to learn something about psychology which might help to understand yourself and maybe also users. And last but not least the documentary of last year’s Transcontinental 2015 tells a story of awesome cyclist who ride across Europe to Istanbul. JavaOne was held las week and if you couldn’t attend it, like me, then you should have a look at the JavaOne 2016 Youtube playlist with 85 recorded sessions. Video from year ago but still relevant as Mikko Hypponen explains why Facebook wants to get your phone number from Whatsapp. Watch from 12 minutes onward. What does that emoji mean? Here’s a list of emoji as JSON, extracted from iOS 10 beta 4. A list of the the ten best iOS development blogs in no particular order. If you’ve ventured to iOS development then most of these are propably familiar, like raywenderlich.com with great tutorials. The Transcontinental is a race like no other. On the 24th of July 2015, 172 riders arrived in Garaardsbergen, Belgium and raced to Istanbul, Turkey. Much like the early days of bicycle racing cyclist ride with no team cars or soigneurs to look after them. It is each for their own taking on Europe’s toughest terrain. The documentary follows the highs and lows of the race from the view of the Race Directors. Technology is everywhere and even in as simple sport as cycling as its core is full of technology from wireless shifting systems to smart suspension systems and electronic motors. I’ve been riding enduro mountain biking and with going downhill in rocky trails it’s good to have some protection for your tires and rims. Puncture prevention systems like Schwalbe Procore and Deaneasy Tube+ helps you to avoid Snake Bites and protect your rim from dents with two air chambers but you can also do it simpler with foamlike solution such as Huck Norris. Huck Norris is a relatively simple technique inside your tubeless tire to protect from Snake Bites and dents to the rim. It looks like it’s made from normal foam sleeping pad but the material (chemically crosslinked polyethylene) is specially developed for MTB use with actual scientists. It has “three times the impact energy damping than anything commercially available”. The installation is as easy as it looks, you just put it inside your tubeless tire and there’s no need for modifications or glue. Huck Norris also makes it easier to mount the tubeless tire without compressor as it gives the tire a shape which helps the bead to set. There’s not much more to said about Huck Norris. Just set it up, inflate the tire and you’re done. It weights 70g on 27.5″ size and 77g on 29″ size, is suitable for 21-30 mm internal rim width and you can use it with alloy or carbon rims. Also Plus size and Fatbike versions are coming soon. Huck Norris is made in Finland and you can get it from Vuoripyörä’s webshop for 50 euros for a pair packaged with a mud guard. For more information check out their webpage or Facebook. Huck Norris was just recently released for general availability and I’ve used it for about month. As you could figure, it makes the tire a bit more stiff than without but the extra protection and especially the possibility to race on mountain bike enduro style tracks with the air pressures you want makes it great. No need to over inflate. But as usual, even Huck Norris can’t protect your rims when the going gets tough although it still might save your race like it did mine on Santa Cruz Enduro Series race at Levi. The special stages were fast with hidden rocks and hits were unavoidable. 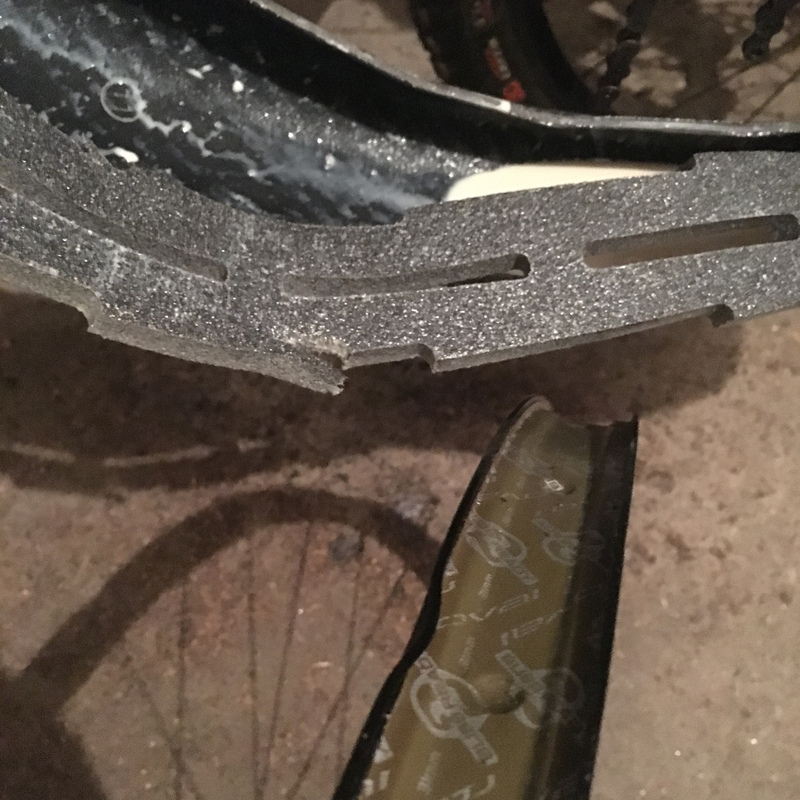 As you can see from the picture I dented my rim but Huck Norris absorbed the impact so that the rear tire was saved from flat and I got to finish the race. I think I broke it on stage 5 and still drove the 7 stages left. For the curious I had Maxxis Minion DHR II 29×2,3 (3C MAXX TERRA) with about 1,5 bar air pressure on Roval Fattie 29 rim with 29 mm inner width. 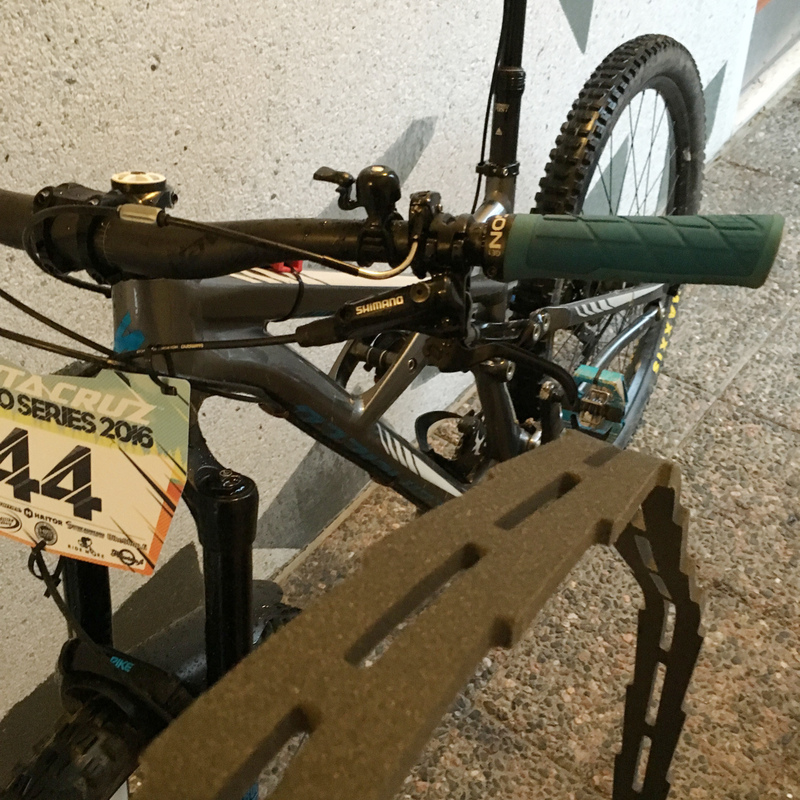 After the Enduro MTB race at Levi where I had broken my 29″ rear wheel I had to switch to my 650b+ wheels for the next race. Not what I would’ve wanted as I don’t like racing with 2,8″ tires. As the Huck Norris is not yet available for Plus sized tires I had to get something to protect the rear rim from the rocks at Santa Cruz Enduro Series race on Tahko. 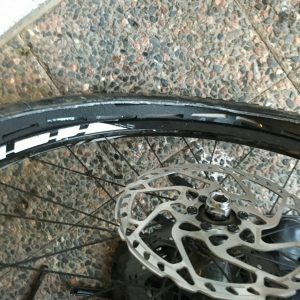 Luckily my local bike shop had Schwalbe Procore system and sold me one separately. A bit more weight to the rear but also less punctures. Schwalbe Procore is a dual-chamber system, tire-within-a-tire anti-pinch-flat system. 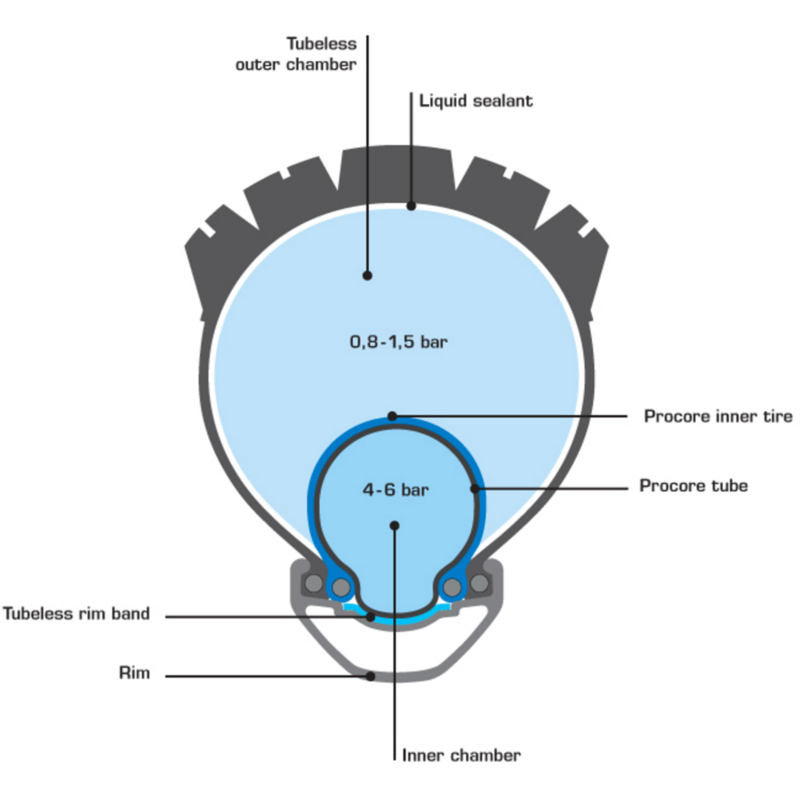 It consists of a small-diameter tube and tire that is inserted inside of a conventional tubeless tire and pressurized to over 80 psi. The insert acts as a secondary impact cushion that allows you to ride with lower, or at least the optimal, tire pressures without being concerned with pinch flatting and protects the rim. 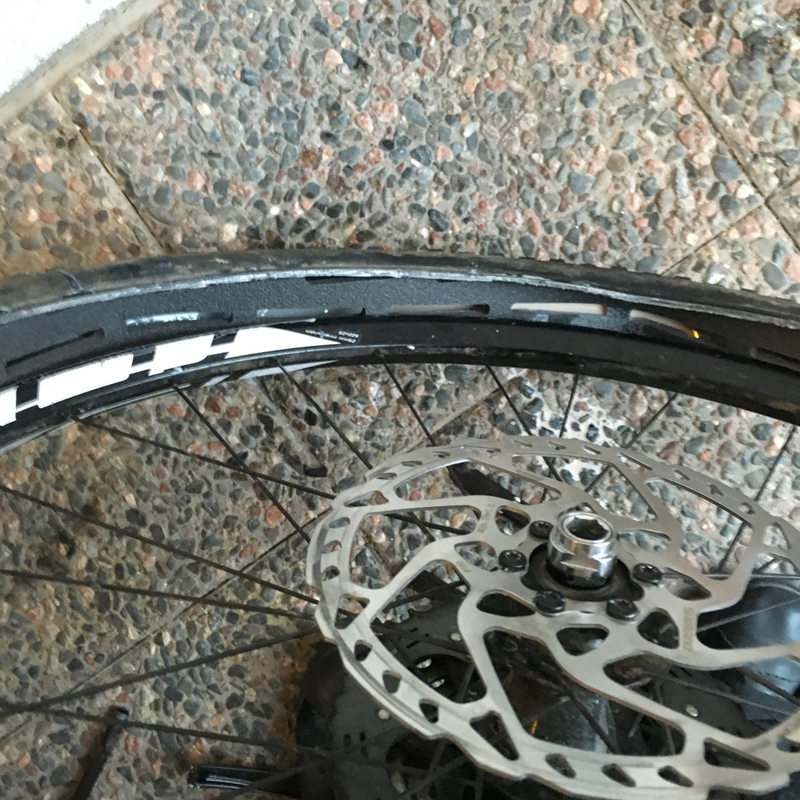 It also helps to prevent the tire from ‘burping,’ which is when the tire bead is pushed inboard of the edge of the rim and allows air to escape from a tubeless tire. Procore is available for 26″, 27.5″ or 29″ rims with minimum of 23mm internal rim width and for minimum of 2,2″ tire. Compared to Huck Norris the weight is considerably more, 220 grams per wheel and it also adds it to the place you don’t want it: to the wheel, increasing rolling mass. Procore system (one pair) costs about 200 euros. 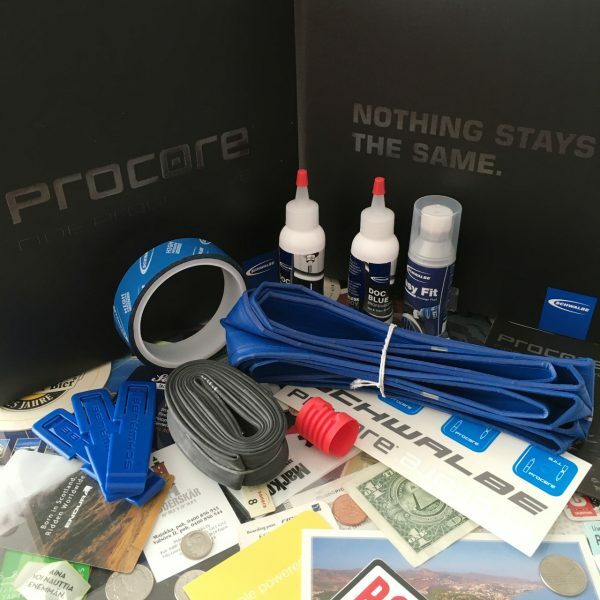 Schwalbe’s Procore kit consists of a pair of tubes and inner tires, a roll of high-pressure rim tape, tubeless sealant, air sleeves, tire installation lubricant, dedicated tire levers, and decals to outfit two wheelsets. I used my existing rim tape as kit’s rim tape (for 25 mm) was useless for my 29 mm rims. Although the Procore looks complicated and I had heard rumors of installing it, in practice it was fairly easy as the installation instruction show. Pinkbike’s review of Schwalbe’s Procore has also good explanation of the installation but the review otherwise is somewhat a mess. The only hassles I had was with keeping the tire sealant inside while getting the bead to set as I was too lazy to empty it. And one thing I forgot to put in place was the small clear patch over the valve hole as an additional seal but it worked anyways. I was in a bit hurry to install the Procore so I don’t have any pictures of it. Why test your new equipment beforehand when you can test it at the race. I have only rode with Procore couple of days, practice and race at Tahko enduro MTB event and some local trails and it does what it promises. Although Tahko race had serious rock gardens my plus sized tire and rim survived without flats or dents whereas other riders had problems. Or maybe I just drove too slow (finished 32th) as I wasn’t exactly comfortable with 2,8″ Nobby Nic tires with 1,2 bar pressure on slippery rocks and grass. Without Procore I would’ve inflated it to at least 1,5 bar. Anyways the extra protection was welcome and money saver. Procore seems to be good system as it doesn’t affect the tire behavior and adds protection but they say in the Internet that the high-pressure inner tube adds strain to the rim, loosens spokes’ tension and there has been a notable number of documented issues with carbon rims. With aluminum rims the issue not so clear and very few aluminium or carbon rim manufacturers have officially approved it but they haven’t recommended against it either. As I didn’t have a spoke tension meter when I installed Procore I can’t say whether or not the Internet is right. Time will tell. Schwalbe’s Procore, in my opinion, is a good solution for protecting your tires and rims while allowing you to ride with lower tire pressures. Compared to much simpler Huck Norris, the more technical dual-chamber systems adds extra protection when needed but also additional weight which isn’t an issue when going downhill but makes a big difference when it comes to accelerating, and for long days on the pedals. But I would think twice before using Procore with carbon rims whereas Huck Norris is suitable for any rim. When I get my 29″ wheels running again I will put Procore to the rear and Huck Norris in the front. Best of both worlds. Atlassian’s web applications are great tools for software development and they are relatively easy to setup because they come with Jetty servlet container and HQSQL database. You only have to install Java. Some of the applications can be also run like any normal deployable WAR-packaged web application for example with Apache Tomcat which gives you more control and administration options. But unfortunately code review tool Crucible isn’t one of those applications and maybe will never be. By default Crucible runs in port 8060 which isn’t nicely looking for users. It’s way better to use ports 80 or 443 which are normal HTTP and HTTPS ports and are omitted from browser’s address bar. Of course you can configure that in the Administration screens, or by editing Crucible’s config.xml and restarting Crucible but if you run Crucible as a non root or also have other software running on the same server that isn’t an option. One solution is to use Apache HTTP server to proxy connections from port 443 to Crucible’s listening port. I did it for Crucible and FishEye on CentOS x86_64 but things are mostly the same also on other Linuxes. I also disabled the HTTP port and used just the SSL enabled HTTPS with self generated certificates. Summer has been relative nice this far even here in Finland and my short holiday is just couple of days away. But before that it’s time to check this years Java tools and technologies landscape report, get some useful plugins for Atom, start developing a React application with no configuration and read about the benefits of Serverless architecture. And while traveling it’s good to listen to podcasts for developers. Developing a React app has lots of things to setup so using Create React App, officially supported way to create single-page React application, as a boilerplate generator is good choice. And with single command, and all the build dependencies, configs, and scripts are moved right into your project so you’re not lock-in. Something to think about how you organize your React code. Similar to how you could organize things with Java application. ZeroTurnaround has just released its Java Tools and Technologies Landscape Report 2016, which analyzes the data about the tools and technologies Java developers use. Good to note that the survey received just over 2000 responses. Chrome’s DevTools is powerful but not always so easy to utilize. Paul Irish and Sam Saccone show off new tips, tricks and features in DevTools to help you debug the performance of your site. When hacking up Bash scripts, there are often things such as logging or command-line argument parsing that: You need every time, Come with a number of pitfalls you want to avoid, Keep you from your actual work. Here’s an attempt to bundle those things in a generalized way so that they are reusable as-is in most scripts. Podcasts are incredibly useful for staying on top of all the latest happenings in software development. Pokemon Go has taken the world with enthusiasm and it requires you to walk around and explore the city for Pokestops, Gyms and hatching eggs. But why do that if you can cheat? Since the game is GPS based with little tinkering you can spoof your GPS location using a HackRF software defined radio and simulate walking around. Web analytics is one the essential tools for a website and including measuring web traffic and getting information about the number of visitors it can be also used as a tool to assess and improve the effectiveness of a website. The most common way to collect data is to use on-site web analytics, measure a visitor’s behavior once on your website, with page tagging technology like on Google Analytics which is widely used web analytics service. But what would you use if you want to keep control over your own data? You don’t have to look farther than Piwik which is open source web analytics application and aims to be the ultimate open alternative to Google Analytics. Here’s a short overview to Piwik Analytics and how to get started with it. Piwik is web analytics application which tracks online visits to one or more websites and displays reports on these visits for analysis. 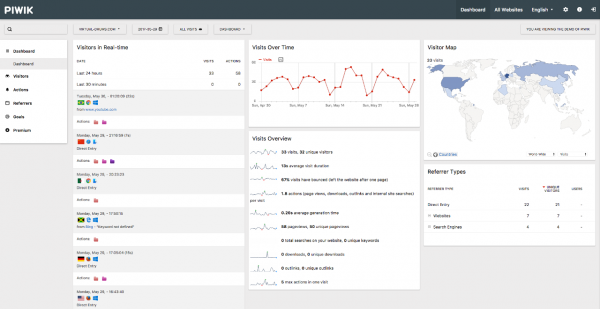 In short it aims to be the ultimate open source alternative to Google Analytics. The code is GPL v3 licensed and available in GitHub. In technical side Piwik is written in PHP, uses MySQL or MariaDB database and you can host it by yourself. And if you don’t want to setup or host Piwik yourself you can also get commercial services. Piwik provides the usual features you would expect from a web analytics application. You get reports regarding the geographic location of visits, the source of visits, the technical capabilities of visitors, what the visitors did and the time of visits. Piwik also provides features for analysis of the data it accumulates such as saving notes to data, goals for actions, transitions for seeing how visitors navigate, overlaying analytics data on top of a website and displaying how metrics change over time. The easiest way to see what it has to offer is to check the Piwik online demo. You might ask how Piwik differs from other web analytics applications such as Google Analytics? One principle advantage of using Piwik is that you are in control. You can host Piwik on your own server and the data is tracked inside your MySQL or preferably MariaDB database: you’ve full control over your data. Software as a service analytics applications on the other hand, have full access to the data users collect. Data privacy is essential for public sector and enterprises who can’t or don’t want to share it for example with Google. You ensure that your visitors behavior on your website is not shared with advertising companies. Other interesting feature is that it provides advanced privacy options: ability to anonymize IP addresses, purge tracking data regularly (but not report data), opt-out support and Do Not Track support. Your website visitors can decide if they want to be tracked. You can also do scheduled reports which are sent by e-mail, import data from web server logs, use the API for accessing reports and administrative functions and Piwik also has mobile app to access the analytics data. Piwik is also customizable with plugins and you can integrate it with WordPress and other applications. Piwik has clean and simple user interface as seen in the following screenshots (taken from the online demo). Setting up Piwik is easy and there’s good documention available for running Piwik web analytics. All you need is web server like Nginx, PHP 7 and MariaDB which has in some cases significantly improved query performance and reliability of Piwik over using MySQL. You can setup it manually but the most easiest way to start with it is to use the provided Docker image and docker-compose. The docker-compose file setups four containers (MySQL, Piwik, Nginx and Cron) and with compose you can start it up. The Piwik image is available from official docker-library. The alternative is to do your own Docker image for Piwik and related services. In my opinion it makes sense to have just two containers: one for Piwik related web stuff and other for MariaDB. The Piwik container runs Piwik, Nginx and Cron script with e.g. supervisor. The official image uses Debian (from PHP) but Piwik runs nicely also on Alpine Linux. One thing to tinker with when using Docker is to get MariaDB access to Piwik’s assets for LOAD DATA INFILE which will greatly speed Piwik’s archiving process. Piwik is good and feature rich alternative for web analytics application. Setting it up isn’t as straightforward as using some hosted service as Google Analytics but that’s the way self-hosted services always are. If you need web analytics and want to keep control of your own data and don’t mind hosting it yourself and paying for the server then Piwik is a good choice.